All-nighters. Leading mission trips. Itemizing the youth ministry budget and keeping track of receipts. All-nighters. Communicating program details via email, text messages, and the latest social media platform. Graphic designer and all-around technology engineer for the entire youth ministry. Staying informed about all latest trends in youth culture. Did I mention all-nighters? Vacuuming, taking out the trash, turning off all lights, and locking the doors after youth group. And don’t forget to foster meaningful relationships with parents, develop an expert team of volunteer leaders, and, most importantly, disciple your students in the way of Christ. I’ve served at my church for 13 years. My wife and I arrived in 2005 when we were newlyweds, the latest platform was Xanga, smartphones didn’t exist, Palm Pilots were high-tech, Xbox 360 was just released, and The Da Vinci Code was the heresy of the day. My current junior-high students weren’t yet born. During that time, I’ve also become affectionately known as “Grandpa McGarry” in my local network of youth workers because I’ve been around so long. 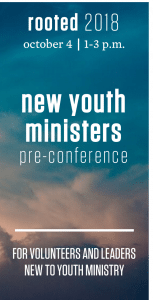 I’ve seen multiple youth pastors cycle through each of the churches around me, generally corroborating the statistic that churches change youth pastors every three years. This leads me to wonder more often than I want to admit out loud: Am I getting too old for this? When I entered junior high in 1992, my parents had just separated, and it felt like my family was dissolving before my eyes. As this was unfolding, my church hired a new youth pastor named Craig. I thought he was old. I realize now he was younger than I am today. But to a junior higher, our church was hiring an old man as youth pastor, and that felt confusing and overwhelming. But I soon discovered something strange: he understood me, and I really liked having an adult listen to my fears and concerns. Craig taught me by example that youth workers don’t have expiration dates. Rather than age as a determining factor, one’s passion for Christ, desire to understand students, and commitment to real-life discipleship should characterize one’s calling to youth ministry. Youth workers don’t have expiration dates. Youth ministry veterans regularly get asked, “When do you want to become a real pastor?” It’s a comment we can only laugh about, because it’s so innocently offensive. But it does unveil a common opinion. Tricky thing is, most of us have wondered the same thing: Am I getting too old for this? Is this still the best use of my gifts and passions? Should I minister to the parents instead of the students? “Let us not grow weary of doing good,” Paul writes, “for in due season we will reap, if we do not give up (Gal. 6:9). Rather than giving up in frustration that our seed-sowing hasn’t born fruit according to our timetable, we must not grow weary. The exegetical context demands a link between “not growing weary in doing good” and the fruit of the Spirit listed a few verses earlier (Gal. 5:22–23). Galatians 6:9 isn’t anchored in ministry longevity, even though that’s the most common application I’ve heard. Instead, it’s a call to longevity in sowing gospel seed. Isn’t that what we’re after? We’re the sower in Christ’s parable, spreading gospel seed all over the place and prayerfully trusting the Lord to bring growth. The gardener has authority to till, weed, and clear land as he sees fit so that thorns can be uprooted and the gospel can take root. We preach, teach, and apply the gospel of grace in order to see lives transformed by the power of God. He uses us, but it’s his work in his time. Fruit doesn’t sprout up overnight—not in the garden, not in youth ministry, not in adult ministry, not in our own lives. So, tired youth pastor, press on. The longer you stay at your church, the more responsibilities are put on your plate. Problem is, your plate hasn’t grown. It’s just more crowded, so the things you don’t enjoy but recognize as “worth it” begin to slide onto the floor. Obviously, from my earlier list, I place “all-nighters” near the top. But since you used to do these things (and did them well; otherwise you wouldn’t have lasted this long), you realize the spillover responsibilities matter, and you feel guilty seeing them on the floor. This only adds to the I’m too old for this feeling. None of this even gets into the conflicts you barely survived or the hurtful comments that ring in your head on the ride home after a lackluster youth meeting. Amid your frustrations, your battle scars, and your struggle over whether to join Snapchat, remember your ministry is built on the gospel. Amid the temptation to believe those who say you’ve “outgrown youth ministry,” remember that while younger youth pastors may connect with students quicker, your age uniquely positions you to dignify a kid whose world is turned upside-down and needs an adult who will listen. I was that kid. Now I get to be that youth pastor. Yes, there are days I want to “jump up” the ladder to a more comfortable fit. But I’m certain I’m of more use to teenagers today than ever. Not merely because of my age, but because students need mature (“uncool”) adults who will pastor them. Don’t grow weary. Continue to sow that gospel seed in your own life and in the lives of teens—even if it requires more all-nighters. Mike McGarry is pastor of youth and families at Emmanuel Baptist Church in Norfolk, Massachusetts. He serves on the steering committee for Rooted and authored one of the chapters in Gospel-Centered Youth Ministry (Crossway, 2016). He is married to Tracy, and they have two children. He is a life-long New Englander and has been educated at Gordon College and Gordon-Conwell Theological Seminary (MDiv and DMin thesis).